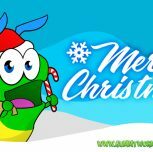 The Gummy Worm & the Gummy Band, send felices fiestas from Gummyland! Sharing life's joy with family & friends, our hearts are filled with love again! Wishing you all a Merry Christmas, peace on earth, hope and happiness!